This post by Nanjira Sambuli of iHub in Kenya (@ninanjira) was originally published in the Hacks/Hacker Africa group on Medium.com. 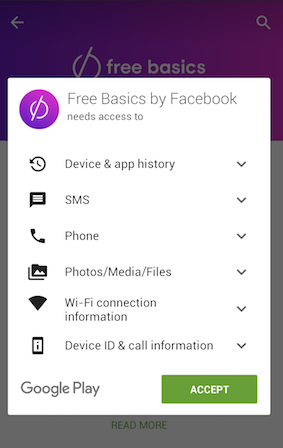 Free Basics is the Facebook app formerly known as Internet.org which offers free mobile Web access to a limited number of websites in partnership with telecommunication companies in different countries. Step Two: Read through the Data and Privacy Policies. Step Three: A Cursory Glance At The Applications Available On Free Basics in Kenya. 17 applications are available on Free Basics in Kenya. Two are news sites:BBC News and Daily Nation. Facebook and its Messenger platform also feature. One can also access Brighter Monday, one of the most popular job sites around, Scholars4Dev for scholarship information, as well as OLX, where one can search for real estate, cars, job listings and more (one can also submit an ad). Ebola Information, Facts for Life, Totohealth, BabyCenter & MAMA offer health information (the latter three focus on maternal and child health). You also have Accuweather (one can get weather information on local towns and cities, and one can search by postal code or city to access more info). Girl Effect offers ‘articles and tips for girls’. Jamii Forums ushers you to various boards to discuss news, platforms, politics and more. Supersport is available for sports updates. Wattpad offers access to free books and stories (none of which are by local writers, to my knowledge). Then there’s good ol’ Wikipedia. That, for now, rounds up the ‘on-ramp to the Internet’ in Kenya. Would be happy to hear from any early testers if any of these apps weren’t there when the initiative was launched. Back then, Facebook had a pre-selected range of applications. Now, they say all it takes to have your content on the Free Basics platform is meeting the participation guidelines and technical specifications, i.e. developing for the platform, to meet zero-rating requirements. Scrolling through a couple of news articles via the Daily Nation app, I noted that the comments section was missing. One can read and share a story, but not comment on it. To share, one has to leave Free Basics, where data charges apply. (Oddly enough, that was the case for the ‘share via Facebook’ plugin on the site). Same thing with the BBC News app. Having found the BBC Africa section, and found a news item on Kenya, I sought a comment section, to no avail. Daily Nation was a pre-selected app for #FreeBasics in Kenya. Means that you get news from a predetermined source by Facebook. Over at Jamii Forums, I quickly scrolled to the ‘Kenya Forums’ section. One can see all the latest posts, and to participate, one has to log in. This presumes that one is already signed up for Jamii Forums. Meanwhile, on the main site (over on the Internet I pay for), there’s a pop up that asks me to register, since I don’t own an account yet. I would be very keen to observe a first time Internet user’s behaviour around this barrier to participation. Jamii Forums homepage screenshot on desktop. See that pop up at the bottom right hand side? Screenshot after clicking through ‘Read more’. … It is not quite clear where the FAQ section within this app is. If one were to report this anomaly, they’d likely go to the ‘Contact’ section. There, one is treated to UNICEF’s contact information (email), and the Ministry of Health Ebola Hotline. Let’s imagine that this app is being accessed in some emergency or panicky situation. Fill in the blanks. Over at the Wikipedia app, I couldn’t even see the option to edit a news article, let alone it redirecting me to the paid-for Internet. My hypothesis: it creates the notion that Wikipedia is to be consumed, and not necessarily contributed to. Imagine that carried across to Wikipedia as many of us know it! The analysis above is selective, and I’ll factor in my own bias (wariness about this version or ‘ramp’ to the Internet). The argument for or against Free Basics takes many forms, primarily of a technical nature. I like to bring back what I call the ‘spirit of the Internet’: the ability to connect, consume, create, collaborate and correct (content)— all in equal measure. The above sets the scene for consumption, which is one component, but not the only component of the Internet. Much in the same way that in many parts of the developing world, the pervasive notion that Facebook is the Internet needs some serious correcting. While I imagine that the Free Basics advocates would say that this only encourages folks to cross over to the open Internet to comment on the news articles or sign up for such popular fora, the assumption is that people are inherently motivated to go to that trouble. This, in a country known for peculiar mobile telephony use. While I don’t have the stats to corroborate my take, I imagine that this would dis-incentivise many from going to the trouble of all the clicks it would take to participate. I could be wrong, but I don’t have the stats. One of the first things I noticed in step two, was the (lack of) Community Standards around Free Basics. Over at the Free Basics Participation Guidelines, it is stated that services are not rejected on the basis of their (Facebook’s) Community Standards. For reference, said standards address self-injury, dangerous organisations, bullying and harassment, attacks on public figures, criminal activity, sexual violence and exploitation, and regulated goods. So we know what does NOT form the basis of rejection of platforms as far as such standards go, so what does? (Or is that since it’s mostly a consume-first platform, these aren’t necessary?). What happens if, say, Free Basics in Kenya or elsewhere, has a niche audience that would form a prime target for some problematic organisation or ideology that violates the community standards? How can Free Basics users learn the principle of self-regulation, that governs paid-for Internet use, including Facebook itself? How do Free Basics users report inappropriate content? Facebook have been saying that at least 50% of Free Basics users have crossed over to the open and paid-for Internet within 30 days of coming online for the first time. Having pushed a bit further on the stat recently, one of their Heads of Policy said that they stay on the paid Internet, though this isn’t part of the popular narrative on the conversion rates. Who else, other than Facebook, has access to these statistics? Giving the benefit of the doubt, say the statistic is actually true. What norms about what the Internet is, does Free Basics (un)willingly postulate? Facebook says that Free Basics doesn’t create a two-tiered Internet and refers to the above statistic. They also say that without such a program, more people are left offline, unable to realise the benefits of the Internet. We all want as many people, if not all to be connected. But the idea of a ‘free’ Internet is a particularly nefarious one, leaving room for loopholes such as these, and actually creating various tiers to Internet access. This has been compared to tiered access to water and education. While some may say that some water or education is better than none, why is it that there are different forms to access? So some Internet is better than none at all (especially for the developing world). But, what constitutes ‘some Internet’? Who decides on what ‘some Internet’ is, and why are they the ones to decide? There are many arguments packed into the zero-rating, net neutrality and Free Basics discussions, and it wouldn’t do justice to pack them into one article. I will try to tackle the various domains, from my perspective, in future posts. Would love to conduct this exercise with first time Internet users. Currently thinking through the research design, to enable unearthing of insights on the Internet they aspire to access, versus versions such as Free Basics issued. For now, I welcome discussion and feedback on the above, and perhaps others to take Free Basics on a spin in their respective territories! After all, advocacy for a free (as in freedom), open and secure Internet will require evidence and not mere opinion. Web We Want is a global initiative of the World Wide Web Foundation to defend internet rights and help shape a better future. outage affects “less than 0.